Justice Ruth Bader Ginsburg accepting her nomination to the Supreme Court from President Bill Clinton. 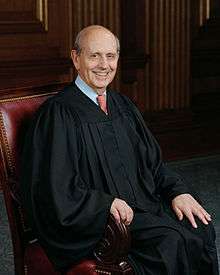 Stephen Breyer, Clinton's second appointee to the Supreme Court. 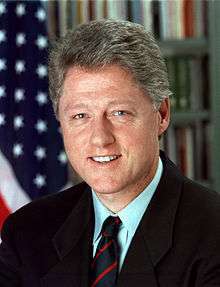 Following is a list of all United States federal judges appointed by President Bill Clinton during his presidency. In total Clinton appointed 373 federal judges, including two Justices to the Supreme Court of the United States, 66 judges to the United States Courts of Appeals, and 305 judges to the United States district courts. Speculation abounded over potential Clinton nominations to the Supreme Court even before his presidency officially began, given the advanced ages of several justices. On March 19, 1993, Justice Byron White announced his retirement effective at the end of the Supreme Court's 1992-1993 term. 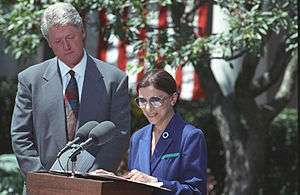 President Clinton announced Ruth Bader Ginsburg as White's replacement on June 15, 1993, and she was confirmed by the United States Senate on August 3, 1993. On April 6, 1994, Associate Justice Harry Blackmun announced his retirement, which ultimately took effect August 3, 1994. President Clinton announced Stephen Breyer as Blackmun's replacement on May 13, 1994, with the United States Senate confirming Breyer on July 29, 1994. 7000100000000000000♠1 Coffman, Jennifer B.Jennifer B. Coffman E.D. Ky.
7001510000000000000♠51 Burrage, MichaelMichael Burrage W.D. Okla.
7002163000000000000♠163 Laughrey, Nanette KayNanette Kay Laughrey E.D. Mo. 7002194000000000000♠194 Sippel, Rodney W.Rodney W. Sippel E.D. Mo. 1 2 Originally nominated on September 14, 1994. Subsequently renominated on January 11, 1995. 1 2 Originally nominated on September 14, 1994. Subsequently renominated on January 24, 1995. ↑ Originally nominated on June 8, 1994. Subsequently renominated on January 31, 1995. ↑ Originally nominated on September 5, 1995. Subsequently renominated on January 7, 1997. ↑ Originally nominated on March 6, 1996. Subsequently renominated on May 7, 1997. ↑ Originally nominated on April 18, 1996. Subsequently renominated on January 7, 1997. 1 2 Originally nominated on March 29, 1996. Subsequently renominated on January 7, 1997. ↑ Originally nominated on April 25, 1995. Subsequently renominated on January 7, 1997. ↑ Originally nominated on November 8, 1997. Subsequently renominated on January 26, 1999. ↑ Originally nominated January 27, 1998. Subsequently renominated on January 26, 1999. ↑ Originally nominated on January 25, 1996. Subsequently renominated on January 7, 1997 and January 26, 1999. ↑ Originally nominated on April 1, 1998. Subsequently renominated on January 26, 1999. ↑ Originally nominated on June 30, 2000. Subsequently renominated on January 3, 2001. 1 2 3 Originally nominated on October 5, 1994. Subsequently renominated on January 11, 1995. ↑ Originally nominated on September 5, 1996.Subsequently renominated on January 7, 1997. ↑ Originally nominated on July 19, 1996. Subsequently renominated on January 7, 1997. ↑ Originally nominated on August 2, 1996. Subsequently renominated on January 7, 1997. ↑ Originally nominated on May 16, 1996. Subsequently renominated on January 7, 1997. ↑ Originally nominated on March 6, 1996. Subsequently renominated on January 7, 1997. 1 2 Originally nominated on May 9, 1996. Subsequently renominated on January 7, 1997. ↑ Originally nominated on May 15, 1996. Subsequently renominated on January 7, 1997. ↑ Originally nominated on November 27, 1995. Subsequently renominated on January 7, 1997. ↑ Originally nominated on August 10, 1995. Subsequently renominated on March 21, 1997. ↑ Originally nominated on December 21, 1995. Subsequently renominated on January 7, 1997. 1 2 Originally nominated on September 16, 1998. Subsequently renominated on January 26, 1999. ↑ Originally nominated on May 11, 1998. Subsequently renominated on January 26, 1999. "Judges of the United States Courts". Biographical Directory of Federal Judges. Federal Judicial Center. Retrieved 2009-04-03. "Judicial Nominations by President Clinton During the 103rd-106th Congresses". CRS Report for Congress. Retrieved 2013-02-23. ↑ All information on the names, terms of service, and details of appointment of federal judges is derived from the Biographical Directory of Federal Judges, a public-domain publication of the Federal Judicial Center. ↑ Linda Greenhouse, Byron R. White, Longtime Justice And a Football Legend, Dies at 84, The New York Times (April 16, 2002). ↑ Federal Judicial Center page on Ruth Bader Ginsburg. ↑ Federal Judicial Center page on Harry Blackmun. ↑ Federal Judicial Center page on Stephen Breyer. ↑ Recess appointment; subsequently nominated by George W. Bush on May 9, 2001, confirmed by the Senate on July 20, 2001, and received commission on July 25, 2001. ↑ Previously appointed to the Tax Court in 1983 by President Ronald Reagan; reappointed in 2000, following a period in senior status.